USS Maine - 1890 - First US Armored Cruiser. 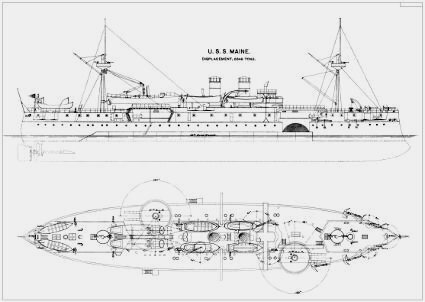 USS Maine was commissioned as the first armored cruiser of the US Navy, not a pre-dreadnought battleship as many believe. In 1898 she was tragically lost in an explosion in Havana, becoming the spark that started the Spanish-American War. The USS Maine was launched in 1890 as the most powerful US warship at the time. Until the Maine, the US Navy had lagged behind almost all other industrial nations in terms of capital ship building. With the ship building effort that was set in motion, staring with the Maine, the US Navy was soon to become one of the most formidable navies in the World. Ever since the Civil War the US fleet had relied on inshore coastal defense and river Monitors. These monitors were greatly improved successors to the USS Monitor, but not all that different. However, they all suffered from low free-board and subsequent poor sea-keeping ability. In that respect, the Maine was an important step towards what was to become the Great White Fleet and a string of powerful US Battleships. She was lost by internal explosion while in harbor in Havana, Cuba. Cuba was still a Spanish possession at the time and the Spanish were under suspicion from the start. The real reason for the loss of the Maine is still a bit of a mystery. At the time it was widely believed that she was maliciously blown up by the Spanish by placing a mine at her side. Whether it was a conspiracy or simply an accident became irrelevant as the usual politics took its course - soon the Spanish-American war was in full swing. She's a graceful looking ship, typically seen with the white hull and buff upper works. The main gun turrets have an interesting location, being placed diagonally off center, or en echelon. The forward turret is to the starboard and the rear to port. For the curious, USS Texas was launched in 1892 and had a mirrored diagonal turret layout. The Maine and the Texas are often confused, and assumed to be "sister ships". In actuality, they were two entirely different designs. As mentioned, the Maine was originally commissioned as an armored cruiser, not a battleship. At the time, there were often little difference between the types. However, generally speaking, a cruiser is a warship where weapons and protection (armor) has been sacrificed to some degree to gain more speed. Even at the time of her construction, the Maine could easily have passed the definition of a second rate battleship. She was never meant to be the most powerful ship on the ocean, but rather an opportunity for the US to learn how to build modern warships. Later in her career, she was officially reclassified as a Coastal Battleship. Looking for a plan of the Maine? Here is a scanned and digitally enhanced plan that could be used for detailing a model of the famous ship. It could also be printed out and hung on the wall or used for educational purposes. The plan is offered in two scales: 1/96 and 1/144. Both these scales are common and often preferred among model boat builders. A model produced in these scales are well suited for RC, if that is where your interest lie. At this time only the GA plan is offered, so no hull lines or model construction. Please order below. Follow this link to learn how you can have the plans printed locally in large format. 1:96 General Arrangement Plan in pdf format. 1:144 General Arrangement Plan in pdf format. For any questions or comments about these plans, please use the form on the Contact Page. There is no injection molded kit of this ship in current production. There also seems to be great confusion as to what old kits there were of this ship. Let's see if we can clear this up. The injection molded kit by Pyro from the late 1950s is the only kit I've bee able to confirm existed. I recently bought one off ebay and paid an arm and a leg for it. It has been released with different artwork on the box, but by all accounts, supposedly the same kit. 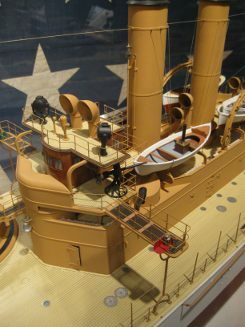 I had heard this kit was a "version" of another kit by Pyro, namely the famous cruiser USS Olympia. 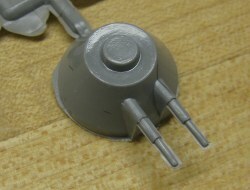 Rumors had it that the hull and several other components were the same, but that there were an additional sprue for offsetting the turrets. This is arguably the most prominent feature of the Maine. With that in mind, I didn't expect this kit to finish into a perfect reproduction of the Maine. The box art is a well rendered picture of the Maine. There have been at least a couple of versions of box art over the years. If you're the least familiar with the two ships, you'll quickly notice that the box art definitively depicts the Maine, and bear very little resemblance to the Olympia, or the kit inside the box. The designers at Pyro honed in on the difference of the profile of the two ships. In doing so, the difference in the funnel's location and shape must have caught their attention. On the Olympia, the rear funnel is round and located about mid-ship. 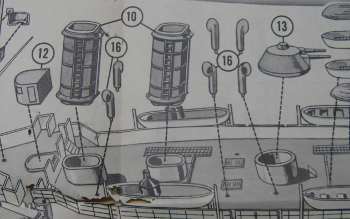 Below you can see a detail from the Pyro "Maine" instructions. This is where the "mods" are as compared to Olympia - the rear funnel is oval instead of round and the fictitious turret has been added where Olympia's rear funnel used to be. Creative, but inaccurate. On the Maine, the rear funnel is oval, and has migrated forward. This is accomplished by providing a separate funnel base. It is instructed to be attached in place of a stack of ship's boats on the Olympia. To "deal" with the round coaming that is left from Olympia's funnel base, a bogus gun turret is provided take its place. 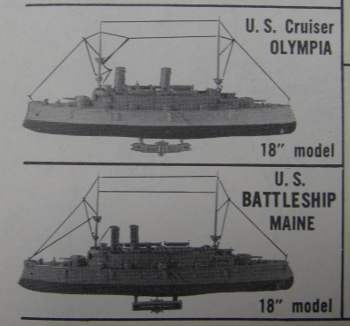 Below is another image from the instruction sheet where completed kits of both the Maine and Olympia are shown. In conclusion, this kit is for the collectors, not the builders. I truly enjoyed the box art - without a doubt the best part about this kit. If you are looking to build the Olympia, buy the Olympia kit. It will cost you less, and the finished model will look something like what's shown on that box. If you want to build a model of the Maine - keep looking. This is not the one. I've read elsewhere that Lindberg and Life-Like released this kit as well. As many of you know, first Life-Like, then Lindberg took over a large part of the old Pyro molds back in the days. I have not been able to confirm this claim. Another unconfirmed anecdote is that Glencoe released their USS Oregon as a re-boxed and relabeled USS Maine. I hope that isn't true and that they would have known better. 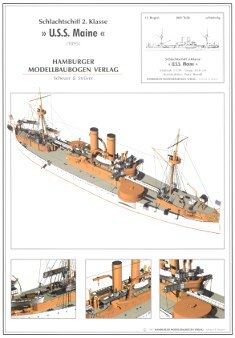 HMV (Hamburger Modelbaubogen Verlag) issued a 1:250 scale waterline model in 1997. This is probably the least expensive, yet most accurate kit currently in production of the USS Maine. It is highly detailed and certainly not for the novice. There was a limited edition kit by Bluejacket a while ago for a static model in 1:128 scale. The kit came with a pre-carved bread and butter hull and fittings made of styrene, Britannia metal, cast resin and photo etched brass. The pictures I've seen are of a beautiful model. Unfortunately the kits are all sold out. 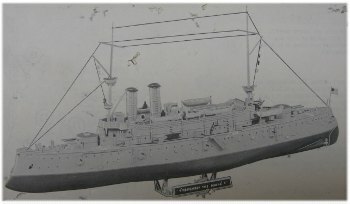 The company Combrig has a 1:700 scale resin kit with photo etched fittings of a waterline model. It appears to be a high quality kit, and in current production. Another Resin kit in 1/350 scale is available from Iron Shipwrights. It's a full-hull and comes with plenty of photo-etched parts.